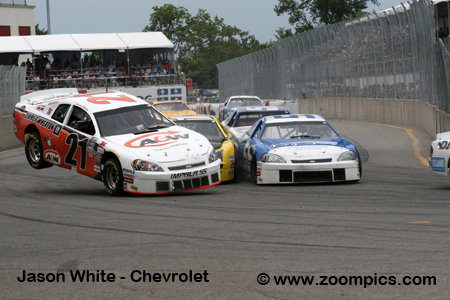 Round eight of the 2010 NASCAR Canadian Tire Series took place on the eleven-turn 1.53-mile Circuit de Trois-Rivieres. 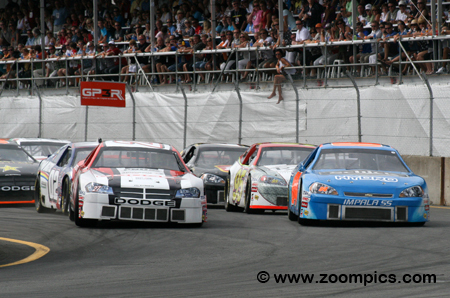 A field of twenty-eight starters enter Circuit de Trois-Rivieres first corner for forty-two-laps of racing. 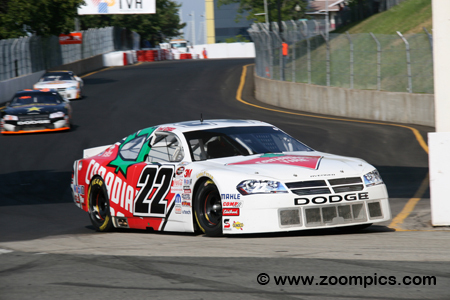 Leading the way is the pole-sitter and defending race winner, Andrew Ranger in the Dodge Dealers of Quebec sponsored Dodge. Beside Ranger, is the second fastest qualifier, J.R. Fitzpatrick driving a Chevrolet Impala SS. Behind the front row are the third and fourth place starters, Kerry Micks and Anthony Simone. It is difficult to bet against Andrew Ranger at Trois-Rivieres. In the series first visit to Trois-Rivieres, Ranger finished second but since then, he has won every NASCAR Canadian Tire event at the track. Ranger drove the No. 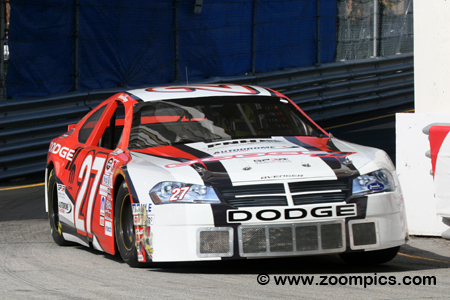 27 Dodge and qualified on the pole for the forty-two-lap contest. Despite an incident with J.R. Fitzpatrick on the second lap, he worked his way through the field for his third consecutive victory at Trois-Rivieres. 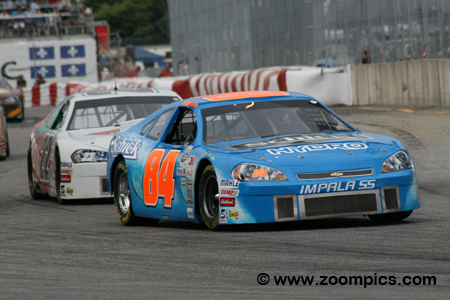 Kerry Micks won the 2007 NASCAR Canadian Tire Series event at Trois-Rivieres and this year it appeared that he might get a second victory at the track. The driver of the Beyond Digital Imaging/Dickies sponsored Ford qualified third. Micks took the lead on lap-13 and held it for nine-circuits. He was in first place during the final caution but was unable to hold off Andrew Ranger on the restart and claimed the runner-up position. J.R. Fitzpatrick entered round eight at Trois-Rivieres second in the point’s chase – just fourteen-markers behind D.J. Kennington. At Trois-Rivieres, he qualified second in the No. 84 Chevrolet. During the second lap of the race, Fitzpatrick had an incident with Andrew Ranger which dropped him down the order. Despite problems with the brakes, he was able to finish third – Fitzpatrick, now led the championship by a single point. D.J. Kennington’s season included victories in the opener at Delaware, St. Eustache and Saskatoon. His main combatant for the 2010 title was J.R. Fitzpatrick won matched him in the win column. To date, the championship lead between the two had changed four-times. 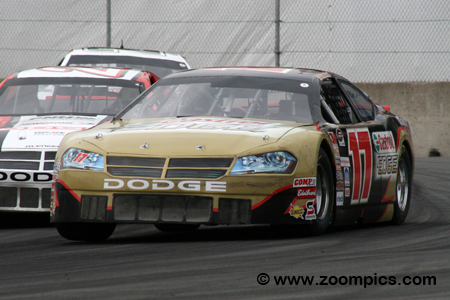 At Trois-Rivieres, Kennington was seventh quickest during qualifying and finished fourth. A good result, but he surrendered first place in the title chase to Fitzpatrick. The driver of the No. 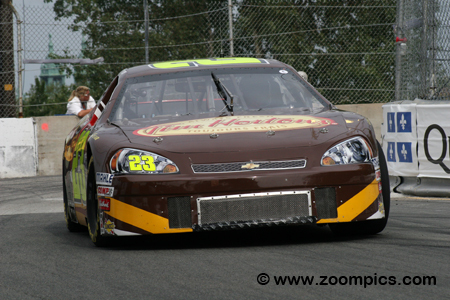 23 Tim Hortons sponsored Chevrolet Impala SS, Jeff Lapcevich started the 2010 season with a third-place finish at Delaware Speedway. Entering round eight, Lapcevich had three top-ten finishes but was only running a partial schedule. He was gridded thirteenth for the start of the GP3R 100 and was fifth at the checkered flag – keeping his string of top-ten finishes alive. The reigning series champion, Scott Steckly had a single victory this season which occurred at Vernon, British Columbia. Unable to match the wins racked-up by D.J. Kennington and J.R. Fitzpatrick, Steckly was a distant third in the championship hunt. During qualifying at Trois Rivieres, he recorded the eighth quickest time but was able to move up the race order and finish sixth. Local favourite and veteran road racer, J.F. 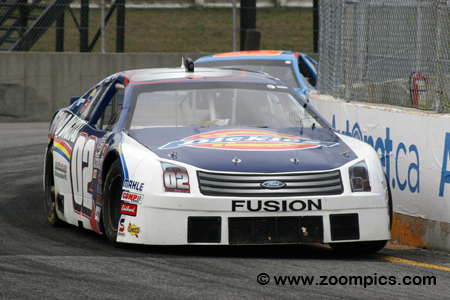 Dumoulin’s only starts in the NASCAR Canadian Tire Series were in the previous three events held at Trois-Rivieres – his best result was a seventh in 2008. 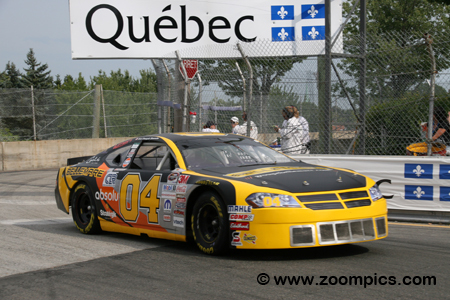 Dumoulin, driving the Group Bellemare Dodge could on manage to qualify fourteenth but used his experience racing at the Circuit du Trois-Rivieres to finish seventh. 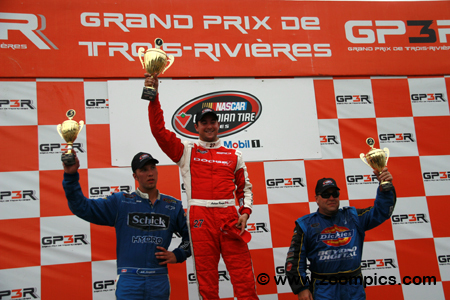 The 2010 NASCAR Canadian Tire Series podium at the Grand Prix de Trois-Rivieres. On the right is the runner-up and 2007 winner of the event, Kerry Micks. To the left and completing the rostrum is the third-place finisher and new point’s leader, J.R. Fitzpatrick. Between these two is the winner, Andrew Ranger. This was Ranger’s third consecutive victory at Trois-Rivieres and second series win of the 2010 season.